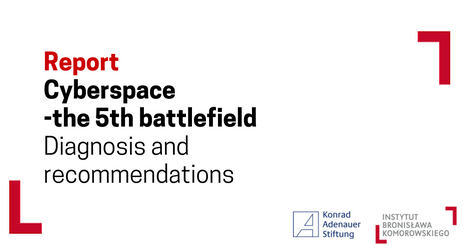 Bronisław Komorowski Institute Report: “Cyberspace – the 5th battlefield. Diagnosis and recommendations” by Krzysztof Liedel and Paulina Piasecka. While analyzing various aspects of cyberspace impact on the understanding of contemporary security – not only in terms of its definition but also in terms of its practice – the role and influence of high technologies of communication and data processing on the contemporary battlefield shall not be omitted. This development resulted in the creation of the concept of network-centric warfare. Main recommentations for the long-term development of cybersecurity systems and capacities of operating in cyberspace. The report is the result of expert meeting organized by Bronisław Komorowski Institute in cooperation with the Konrad Adenauer Stiftung. The planning of actions aimed at ensuring cybersecurity of the state, its public and private sector as well as its citizens, requires specification of terms related to this field of security systems’ functioning. Referring to “the cyber security doctrine of the Republic of Poland”, it is possible to distinguish two distinct terms describing the security of a state in the context of its functioning in cyberspace. The first one is the notion of cybersecurity – the security of the state in cyberspace. This term is defined as the process of securing the safe functioning of the state as a whole in cyberspace. The state is understood as its structures, natural and legal persons, including entrepreneurs and other entities without legal personality as well as information and communication technology networks and information resources in the global cyberspace, which the state has at its disposal. Another term described in the Doctrine is the security in the cyberspace, hence a part of the cybersecurity of the state, which encompasses a set of actions: organisational and legal, technical, physical and educational, which need to be undertaken. They aim at ensuring the functioning of the national cyberspace without any disruption, providing the public and private critical information and communication technology networks as well as guaranteeing the security of the processed information resources. after a potential attack – the reconstruction of the ability and functioning of the systems; creating cyberspace. promoting long-term partnerships and cooperation between public and private sector, especially with regards towards private providers of key elements of information and communication infrastructure of the state.